Part-time NASCAR Camping World Truck Series driver and occasional Jalopnik contributor Parker Kligerman just surprised everybody and won at Talladega Superspeedway. When trucks started to pile up behind him on the last lap, he simply drove away from it to nab his second career NCWTS win at ‘Dega. Championship leader Bell had started from pole position and was gunning for the win on the final restart, but Kligerman started from the bottom line, which proved to be faster. Kligerman, with a bit of drafting help from Grant Enfinger, pulled out ahead. 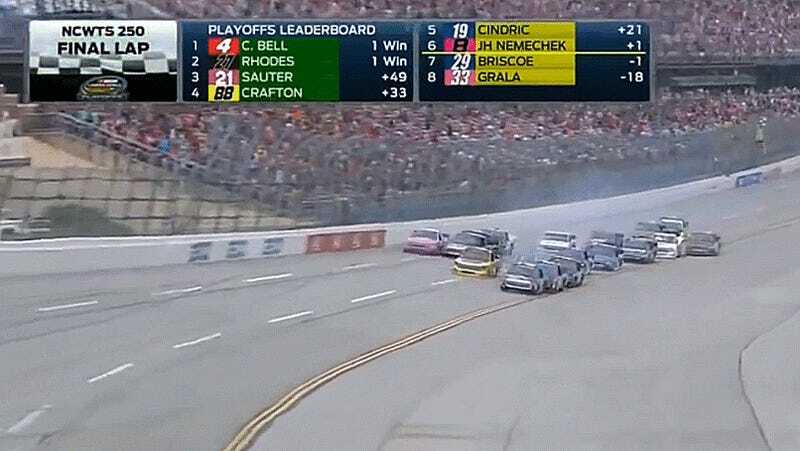 Another “big one” formed behind the leaders at Turn One of the final lap, freezing the running order to give Kligerman the win. Parker’s last race win was at Talladega in 2012, when he competed in the full season but had switched teams to Red Horse Racing mid-season. This year’s win was an even bigger surprise, as Kligerman has only competed in a handful of races this year and driving for the lower-budget Henderson Motorsports team. It’s exactly the kind of underdog surprise win I live to watch. Kligerman’s win wasn’t the only big surprise of the race. John Hunter Nemechek—That Guy from Mosport last year—drove his already crashed truck back up from the rear through the two giant crashes in the race’s last 25 laps to finish sixth. 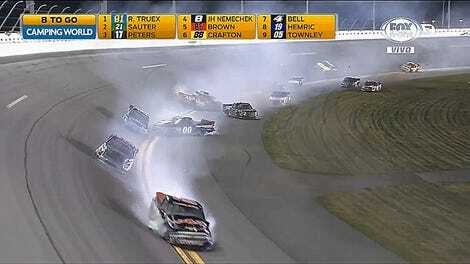 Nemechek’s truck was heavily damaged in a crash at the start of the final stage, but got fixed and started clawing its way back up. That sixth place finish was enough to score Nemechek a spot in the Round of 6 in the Camping World Truck Series’ playoffs. It’s NASCAR on a superspeedway, man. There will be bumps. Kligerman dedicated his pink ribbon wearing truck’s win to breast cancer survivors in his post-race remarks. The ribbon was for Carrier’s mother-in-law, a breast cancer survivor who recently passed away. Congratulations, Parker! If there’s anything I’ve learned this year, it’s that the Jalopnik writers’ bump works eventually. Sort of. Whatever. There’s hope for us yet!